There are endless ways to enjoy the sights of the city, from bike routes to boat tours, but if you’re looking to do some speedy sightseeing that’s both fun and a little different, then sign up for a Barcelona Segway tour! A Segway is a two-wheeled, electric personal transporter. They have become increasingly popular over recent years and make for an eco-friendly way to explore the sights of Barcelona. Walking and biking tours can be tiring, so Segways are a great way to discover the main attractions of the city, without the sore feet! 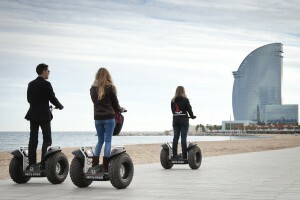 There are many Barcelona Segway tours, so below we’ll outline a some of the best tours you can enjoy, and throw in some fun Segway facts, too. From the winding streets of the Gothic Quarter to the old harbor, and from Barceloneta beach to the Ciutadella Park, Barcelona Sun & Segway will take you to the must-see areas of the city. There are several different tours which all consist of non-stop fun and will combine sightseeing with historical facts, plus advice for what to see and do throughout the rest of your stay. The hosts are very knowledgeable about Barcelona, so you can ask as many questions as you like and enjoy some fun anecdotes as you ‘glide’ around the city on your Segway tour. What’s more, if you’re coming to Barcelona with a large group or on a romantic getaway for two, this company also offers private tours, making for a more personal experience! Fun Segway fact: A Segway is faster than a squirrel. With a top speed of 12.5mph, a Segway can certainly outpace a squirrel, which at full speed can reach only up to 12mph. 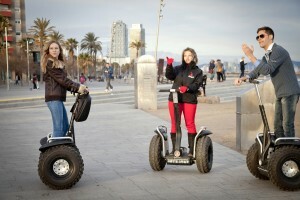 In this 1 hour Segway Tour, you will discover Columbus and Ramblas, Port Vell and Barceloneta big rides so that once there, the smell of the sea lead you to the beaches of Sant Miquel and Sant Sebastian, where you will approach an icon of BCN, hotel W.
This 90 minute panoramic tour along the seafront is perfect for enjoying the sunshine, the monuments and the beaches along Barcelona’s coastline. Two and a half hours of sunshine and Barcelona magic await on this tour, which passes Port Vell and Port Olympic before cruising around the Ciutadella Park and Arc de Triomf. This tour goes along the seafront and up Avinguda Diagonal into the heart of the city. Discover cultural and gastronomic highlights of Barcelona in this three and a half hour experience. Fun Segway fact: There are 80,000 Segways in the world. That’s more than the population of Harrogate, UK (70,000). If you’re interested in a day trip outside of Barcelona, then head to Girona, only a short bus ride away, where these Segway tours are offered as well. Here you can cruise around the historic Cathedral and zoom by the colored apartments on the Onyar River. 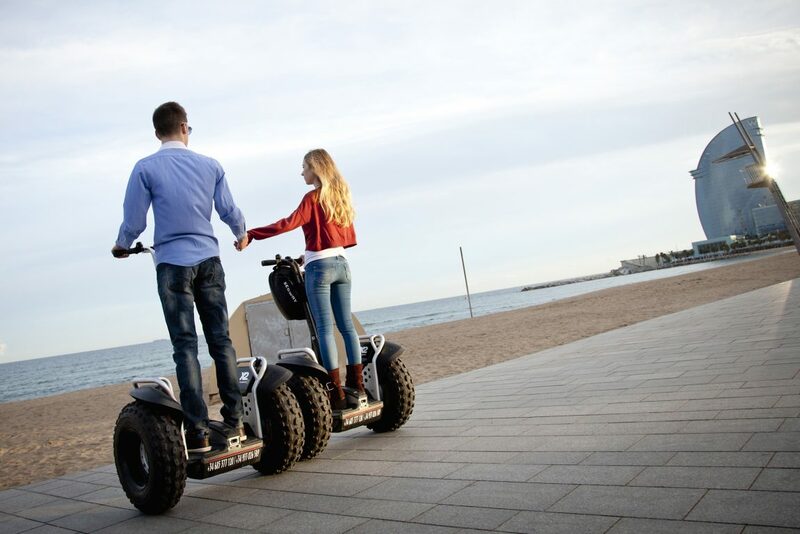 So, whether you’re looking to visit all of the city’s best sights, or simply try something different on your trip to the Catalan capital, a Segway tour of Barcelona is a fantastic way to explore, and save those tired legs! Helmets on!